Performed at the Swan Theatre in July 1597, “The Isle of Dogs,” a satirical play (now lost) written by Thomas Nashe and Ben Jonson was labeled “seditious, slanderous, and lewd” by the government and led to the arrest of the actors (including Jonson) and the closing of all London theaters for months. The nature of the satire is unknown, but comparing court figures to mangy curs is not far from the realm of possibility. No such drastic punishment awaits Wes Anderson’s (“The Grand Budapest Hotel”) modern day Isle of Dogs, however, though there are some who would be inclined to banish it to movie purgatory for its many Japanese cultural references that tread a thin line between homage and appropriation. If sumo wrestlers, haiku poetry, Kabuki theater, sushi, taiko drums (courtesy of composer Alexandre Desplat (“The Shape of Water”), cherry blossoms, and symbolic mushroom clouds are your thing, however, you have come to the right place. Written by Anderson from a story by Roman Coppola (“Moonrise Kingdom”), Jason Schwartzman (“The Darjeeling Limited”) and Kunichi Nomura, Isle of Dogs is a stop-motion animated adventure about a boy and his faithful pet out to prevent the genocide of the dog population of Megasaki City in Japan. Thanks to the superb work of cinematographer Tristan Oliver (“Loving Vincent”), it is beautiful to look at and is filled with the kind of offbeat, captivating energy of which Anderson is a master. Oh, yes, the Japanese voices are untranslated to add more authenticity or confusion as the case may be. Set in the fictional city of Megasaki twenty years in the future, Mayor Kobayashi (voiced by Nomura), a villainous Toshiro Mifune look-alike, has used the fear of possible contamination of humans by “Dog Flu” and “Snout Fever” to exile the city’s canine population to a forbidding place called “Trash Island,” a disposal site filled with neatly compacted piles of garbage and inundated with rats. Ignoring the fact that political rival Professor Watanabe (voiced by Akira Ito, “Birdman”) is working on a Dog Flu vaccine that will prevent the spread of the disease, Kobayashi first sends the household guard dog Spots (voiced by Liev Schreiber, “Spotlight”) to the island, breaking the heart of Atari (voiced by Koyu Rankin), his 12-year-old nephew and ward, an orphan whose parents were killed in an accident. One is tempted to ask, along with Megasaki’s news translator (voiced by Frances McDormand, “Three Billboards outside Ebbing, Missouri”), “Whatever happened to man’s best friend?” As the exiled dogs scrounge for food on the island, one pack forms a bond. These previously household pets include Rex (voiced by Edward Norton, “Collateral Beauty”), King (voiced by Bob Balaban, “The Monuments Men”), Boss (voiced by Bill Murray, “St. Vincent”), and Duke (voiced by Jeff Goldblum, “Thor: Ragnarok”). There is an additional dog in the group, however, an undomesticated stray named Chief (voiced by Bryan Cranston, “Power Rangers”). Chief is an outspoken black dog who decides that he is the leader of the pack even though decisions have been made democratically. Chief is not too fond of humans and, in a moment of introspection, tells his friends that he bites even though he claims that he is not a violent dog. These gossipy dogs are all believable characters who long for the comfort of their former life. Rex recalls huddling with his master by the fireside, Boss remembers being a mascot for a sports team, and King reminds everyone that he was once a commercial star who promoted Doggy Chop pet food. Even Scarlett Johansson (“Ghost in the Shell”) shows up, voicing Nutmeg, a show dog who falls for Chief’s gentle overtures, as well as Tilda Swinton (“Okja”) as Oracle, a dog with the powers of precognition. Of course, these Japanese dogs all bark in English and do not understand one word of Japanese, even though they were raised in Japan. Meanwhile, Atari, who along with Spots, wears an earpiece that serves as a tracking device, crash lands his plane on Trash Island in an attempt to find his beloved pet. As Atari lands, he is greeted by our five enterprising dogs who do not know whether to eat him or comfort him. Eventually, they endearingly name him “The Little Pilot” and help him crisscross the island to find Spots. The search unleashes a twisty adventure that is so full of Andersonian moments of high strangeness that you may feel as if you’ve just entered a parallel universe. It is all great fun, however, even though there is one unnecessary subplot about an American exchange student Tracy Walker, (voiced by Greta Gerwig, “20th Century Women”) who alerts the sleepy Megasakians about a conspiracy involving the corrupt Mayor. White savior, anyone? Wes Anderson’s ninth feature and his second using stop-motion animation (first being “Fantastic Mr. Fox”) has a universal appeal, though it may be a little daunting for children untrained in the nuances of quirk. 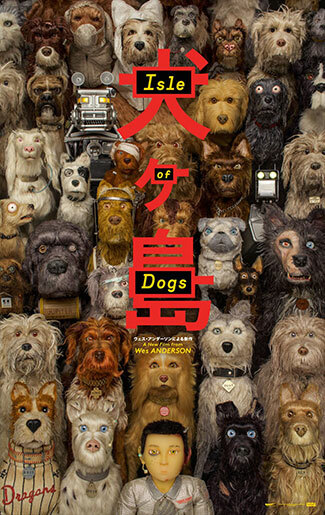 For those tuned into his style, however, Isle of Dogs is Anderson at his subversive best. While some may read into it political implications about corrupt leaders using their skewed version of truth to achieve a dubious end, basically it is just a sweet children’s adventure story about a little boy and his lost dog. It is — isn’t it?